Membership subscriptions can be paid as instructed below and are valid from 1st January for a single calendar year. Please remember that a subscription paid in December will therefore only be valid for one month and will have to be renewed the following January. Existing members can renew their subscriptions from January 1st each year via online payment. Please use the address slip on the Journal wrapper to inform us, through Oxford University Press, of a change of address, or write to the Membership Secretary (see details above). Payment is required with all orders and subscriptions are accepted and entered by the volume(s). Please send orders and requests for sample copies to: Journals Subscriptions Department, Oxford University Press, Great Clarendon Street, Oxford, OX2 6DP, UK. Tel. (0)1865 267907. Fax (0)1865 267485. 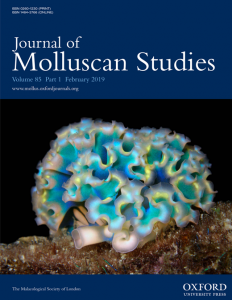 Journal of Molluscan Studies (ISSN 0260-1230) is published quarterly in February, May, August and November by Oxford University Press, Oxford, UK.